54490 Features: -Made of wood, moss, bark and polymer.-Made in Italy. 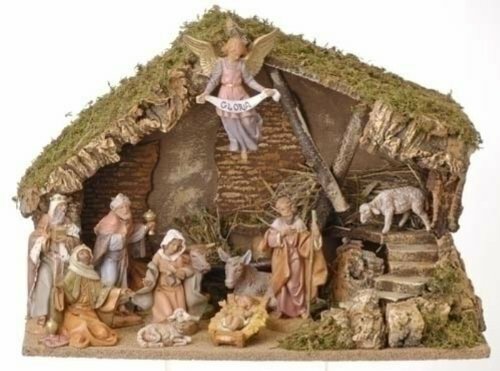 Includes: -Set includes Joseph, Mary, baby Jesus, three kings, sheep, Gloria angel, seated oxen and seated donkey. Dimensions: -Stable dimensions: 11.5'' H x 16.75'' W x 8.5'' D. Collection: -Designed for 5'' scale collection. Dimensions: 8.5 x 16.8 x 11.5 inches ; 7.5 pounds. Made by Roman.